Aylen Pritchin was born in 1987 in Saint-Petersburg, Russia. He began violin lessons at age 6. He studied at the Special Middle School of Music of the St Petersburg State Rimsky-Korsakov Conservatory (class of Honored artist of Russia Elena Zaitseva). In 2010 graduated the Moscow Tchaikovsky Conservatory (class of People`s artist of Russia, professor Eduard Grach). He is currently Eduard Grach’s assistant and soloist of chamber orchestra Moskovia. 2014 - Long–Thibaud–Crespin Competition International Competition (France, 1st prize). 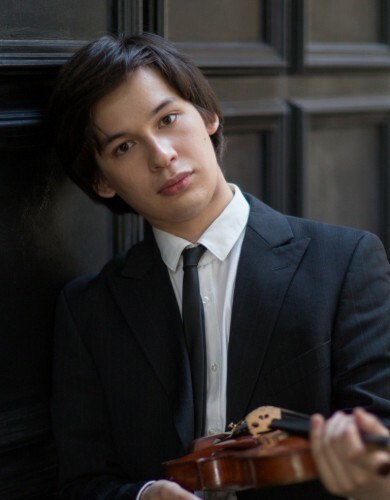 During last years he became a laureate of Sion Valais International Violin Competition (2009, Swiss), Fritz Kreisler International Violin Competition (2010, Austria), Oistrakh International Violin competition (2010, Russia). In 2011 Aylen got the special jury prize at Tchaikovsky International competition (Russia) and became a laureate of Wieniawski International Competition (Poland). Also this year he made his debut in Salzburg (Salzburg Festival), Amsterdam and made chamber music recordings with Italian pianist Francesco Libetta. Aylen participated in master-classes with Shlomo Mintz, Yair Kless, David Takeno, Gyorgy Pauk, Jossif Rissin, Zakhar Bron, Vadim Gluzman, Hatto Beyerle, Natalia Gutman, Boris Berman, Vadim Sakharov. Aylen Pritchin gave performances in numerous cities of Russia, Switzerland, Netherlands, Bulgaria, Israel, Poland, Belgium, Czech Republic, France, Germany, Japan including such hall like St.Petersburg Philhamonic Great Hall, Great hall of Moscow Conservatory, Tchaikovsky Philharmonic Hall, Fukui Hall, Great Hall of Vienna Konzerthaus, Grosser Saal Mozarteum, Amsterdam Concertgebouw (Kleine Zaal), Tel-Aviv Opera House, Hanoi Opera House. Aylen Pritchin collaborated with such conductors as Cornelius Meister, Yuri Simonov, Dorian Wilson, Shlomo Mintz, Fabio Mastrangelo Roberto Benzi, Hiroyuki Iwaki. His wide repertoire including works from Bach, Biber to Lutoslawski, Saariaho and Widmann.